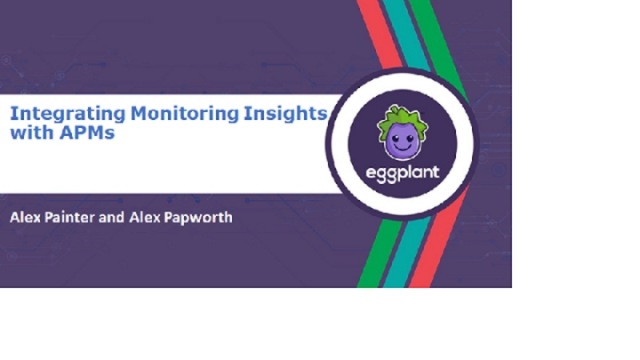 Any organisation needs a reliable synthetic monitoring solution, and Eggplant’s Monitoring Insights has long been considered ‘best of breed’ in this area. The uniquely stable platform and double testing methodology mean you get timely, accurate alerting, without wasting time on false positives. But to help investigate the underlying causes of errors, it can be useful to link your synthetic monitoring tests to an application performance management (APM) solution. In this webinar, we show you how it’s done, so you can have the best of both worlds – reliable synthetic monitoring that integrates seamlessly with your favorite APM. Eggplant and PractiTest are joining forces to give testers and test managers better control of their projects, and the capacity to provide complete visibility to their stakeholders. Join this webinar find out how you could benefit from this integration. Eggplant’s Digital Automation Intelligence is an AI-driven test automation solution that can test the full customer experience, actively hunting bugs, predicting the quality of releases, and using intelligent image recognition to test through the eyes of the user. PractiTest provides a Test Management system for your QA and Testing process. This allows you to control your testing tasks while getting complete visibility of your results, and most importantly, release your products in a professional way. Now that these systems will work together seamlessly, you can have greater control over all your testing, providing everyone in the project with the information they need, in the format they expect it, and at the time they require it. This webinar will give you an overview of both solutions and include a practical demonstration that will show you what you can expect to gain by integrating them. For some, software affects business outcomes like conversions and revenue. For others, software can ensure a patient is properly monitored in the hospital or an astronaut safely returns to Earth from a mission. Traditionally testing and monitoring have been used to check if software "works" without looking at the implications. And that's a problem. It means that software is released on the strength of being ‘good enough’ from a technical viewpoint, without necessarily doing what it needs to do for the organization. Link intelligent test automation in dev with monitoring of real user behavior in live – and associate both with business KPIs. This includes using AI-assisted testing to diagnose functionality, performance and usability issues, and predicting the success of an app on release. For a retailer this could mean boosting revenue and saving costs. For a healthcare provider it could mean saving lives. In this webinar we’ll show you how organizations such as Cerner, Citibank, and Walmart have used this approach to improve performance by 23%, increase app store rating from 3 to 4.5 stars, and cut the cost of testing by 47%. Why do customers abandon purchases? Poor-performing pages in the conversion funnel can leach success from an otherwise effective marketing campaign. In this webinar, we’ll show you how an often-overlooked factor can cause people to drop out before completing a sale and how to identify problem pages quickly and easily. Finally, we’ll bring you simple but powerful and rarely used techniques for slicker user journeys that deliver real, measurable improvements in conversion. In this webinar, we’ll explore some of the best fits for Robotic Process Automation and how you can use it to enhance efficiency and security in your organization. Don't worry, a robot will not be replacing you, just enhancing your abilities and productivity! While it’s critical to know the extent to which an application meets functional requirements, there is more to software testing than answering the question ‘does it work?'. You also need to know if it scales (performance testing) and if the user experience will be acceptable (usability testing). Ultimately, you need to establish that it will deliver the required business value. Until now, these extra steps have added layers of complexity in terms of timing, cost and expertise. As a result, they can introduce delays or get overlooked completely. • Seamlessly integrate them with functional testing, including using your functional test models to drive performance tests. The result: faster release cycles, less duplicated effort, and better software. We will also show you how to test enterprise-scale software systems more easily, with submodels allowing you to break down a large, complex system model in a way that makes it far easier to manage. - Analyze all aspects of the user experience. - Expand automation beyond test execution with AI, machine learning, and analytics. - Take a coherent approach to monitoring and testing. In the new world of mobile apps, cloud services and the Internet of Things, people, processes, data and devices are all converging to reshape how day-to-day business is done. This widens the customer’s experience beyond a single, siloed, application into a much broader context, where not everything is under your control. In this presentation, Dr. Gareth Smith will outline the challenges of delivering quality digital experiences, the benefits of employing predictive analytics and an approach for achieving amazing digital experiences by focusing on the customer experience and the goals of the business. Join our webinar to learn about Eggplantium, a simple way to run Selenium WebDriver scripts against mobile devices. It is simple to set up, provides a robust connection to all mobile devices, extended control including screen rotation and hardware buttons, and a VNC connection for remote manual control. Eggplantium makes it easy for anyone writing Selenium WebDriver scripts to run them against mobile devices in a reliable way and access the richer functionality of the device. Eggplant have teamed up with industry-experts, SQS, to demonstrate how AI-powered automated testing can be leveraged within the manufacturing industry. Join this webinar to find out how model-based testing can be used for validating different scenarios. Eggplant and QualiTest team up in this webinar to cover testing in the medical device industry. Testing in medical devices takes domain knowledge, experience in how to test appropriately for diverse technologies and users, and require a solution that can non-invasively test the permutations and combinations of customer journeys to ensure both a quality product and a delightful customer experience. We will focus on Accuray, a medical device manufacturer that sells radiation oncology systems that make cancer treatment shorter, safer, smarter and more effective. Following the discussion on how Eggplant and QualiTest helped Accuray continuously increase the quality and efficiency of testing their applications, there will be a demonstration against an Accuray medical device. Eggplant Performance for JMeter is a fully functional version of Eggplant’s load testing solution that can be used with JMeter Test Plans. Eggplant Performance adds strong test composition, environment management, dynamic control, and result analytics to JMeter’s existing scripting capability. Customer experience in retail is always the #1 priority. Though the focus is heavily on e-commerce and digital, point of sale systems are as significant as any feature when ensuring a smooth shopping experience for your customer. However, the increasing complexity of point of sale makes it a challenge to test, especially considering it must integrate with a number of other systems such as payment processing, rewards programs, mobile ordering, order fulfillment, and more. Join our webinar to learn about true test automation for point of sale, and how end to end testing can ensure amazing digital experiences for your customers. AI is clearly the big topic in testing this year, but how is AI really going to impact testing over the next two years? We've all seen lots of pictures of cyborgs, Alexas, and self-driving cars, but very little information about how AI is really going to change test creation, running tests, reviewing results, setting up test environments, and all the other activities testers do today. This presentation describes 4 concrete ways AI is changing testing, so you can start making use of the cool real technologies that are available today, and planning how you're going to use these technologies to transform testing in your team. Join our discussion on how hospitals are using Eggplant. We'll be speaking with Dave Hester, testing coordinator at UNC Health, who will cover how his group uses Eggplant to scan patient images and correctly file them into patient records in their EMR. We will be answering your questions and discussing impactful topics to help you succeed. Eggplant's Aerospace and Defence webinar series returns to explain how leveraging it's DAI solution can ensure software QA teams move away from simple code compliance, and into ensuring operator safety. Join our webinar to learn about the specific challenges when testing in Defense and Aerospace, and how Eggplant can consistently enable successful mission outcomes. In the age of automation, modern testing has to be about both technology and business metrics. Artificial intelligence and analytics are drastically changing the way development teams, test, monitor and deliver applications. Join this live webinar with Agile and Product experts from Eggplant to learn how to deliver better customer experiences and ensure faster, better web applications. In the highly competitive financial services industry, companies’ online and mobile interactions with customers are make-it or break-it experiences. So how can you ensure an amazing experience for your users? Join our webinar on how Eggplant has helped companies like Citi, Nationwide, and Atom Bank deliver amazing digital experiences to their users. How do product and testing teams keep up with DevOps, improve productivity, time to market, and customer satisfaction, while creating amazing digital experiences? Join us for a webinar to learn about a new approach to testing that empowers teams to quickly and continuously create amazing, user-centric digital experiences. We call it Digital Automation Intelligence and it uses AI, machine learning, and analytics to predict business and user impacts across different interfaces, platforms, and devices. Please note this webinar will be in Chinese. Join our webinar where we dive into how using AI to achieve true test automation in your hospital systems can alleviate the burden of testing your EMR and other technologies end to end. Eggplant works to ensure your hospital systems are running smoothly so staff isn't frustrated and patient safety isn't compromised. We'll cover test automation across everything from EMR/EHR, ERP software, PACS, blood bank technology, patient portals, and much more. Eggplant provides user-centric, digital automation intelligence solutions that enhance the quality and performance of the digital experience. Only Eggplant enables organizations to test, monitor, analyze and report on the quality and responsiveness of software applications across different interfaces, platforms, browsers, and devices, including mobile, IoT, desktop, and mainframe. Learn more at eggplant.io.